Alaska Communications, American Telesis, BT Global Services, Cincinnati Bell, Consolidated Communications, Crown Castle Fiber, DQE Communications, Expedient, FiberLight, FirstLight, Fusion, Global Cloud Xchange, Great Plains Communications, Hawaiian Telecom, Logix Fiber Networks, LS Networks, Lumos Networks, Masergy, MegaPath, Midco, NTT America, Orange Business, RCN Business, Tata, TDS Telecom, Telstra, TPx Communications, Unite Private Networks, US Signal, Vodafone, WOW!Business and other companies selling retail Ethernet services in the U.S. market. 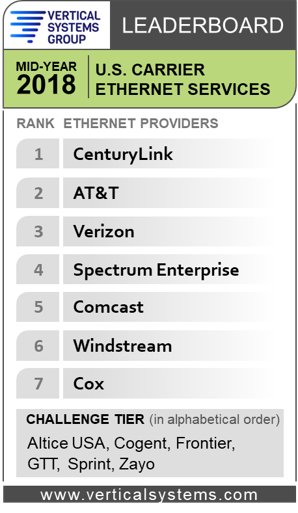 Detailed Ethernet share results that power the Mid-Year 2018 Carrier Ethernet LEADERBOARD are available now exclusively through Vertical Systems Group’s ENS Research Program subscribers of @Ethernet. Contact us for subscription information and pricing.